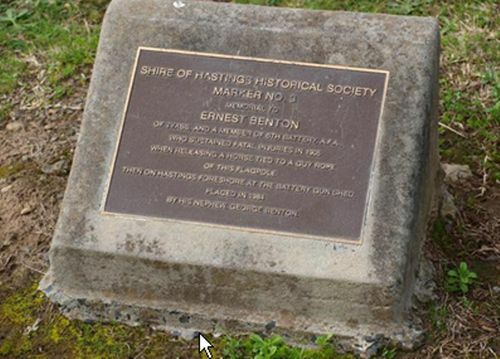 The plaque commemorates Ernest Benton, 6th Battery Australian Field Battery (AFA) who died of injuries received while releasing a horse from a flagpole. The plaque was originally attached to a flagpole that was erected as a memorial to Ernest Benton. 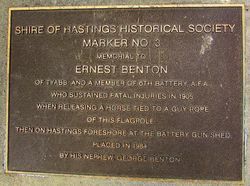 A very sad fatality occured at the Hastings Battery this afternoon, when a young artillery driver named Ernest Benton lost his life. The horses of the battery had been tied to the guy rope of a block pole, and one of the animals becoming restive, began to kick. Driver Benton attempted to quieten the horse, but it backed away, breaking the guy rope, and causing the block pole to fall on Benton's back, pinning him to the ground. He was conveyed on an ambulance and taken by train to the Melbourne hospital. It was found that the unfortunate man's spine was fractured, and he died in a few hours. Riverine Herald (Echuca, Vic. : Moama, NSW), 26 April 1905. The plaque is now in a garden bed near the Tyabb War Memorial as the flagpole was removed in 2013 due to safety concerns. This information was provided on 30 April 2013 by Colin Myers, Team Leader - Asset Management & Samantha Dalla Santa, Contract Coordinator, Mornington Peninsula Shire Council. Memorial to ERNEST BENTON Of Tyabb And A Member Of The 6th Battery A.F.A. Who Sustained Fatal Injuries In 1905 When Releasing A Horse Tied To A Guy Rope Of This Flagpole, Then On The Hastings Foreshore At The Battery Gun Shed.